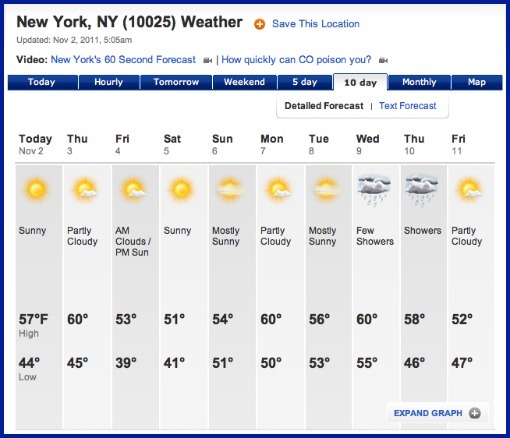 I cannot believe that I can finally see my wedding day in the 10-day weather forecast! 52 and sunny...I'll take it! We're planning on taking our wedding portraits here, but only if the weather cooperates. There's a backup plan, but I really don't want to talk about it. The sun is going to be high and bright on November 11th. It's God's little birthday gift to me, he told me so himself. Just wondering, how was the weather on your wedding day? It was August so it was hot! It rained while we were in the church so the park pics where scratched off the list and we took our pics indoor but all worked out! Ours was hot,hot,hot too! I always think when you look at the photos how you can't really tell how scorchingly hot it was. Luckily our programs were paper fans- everyone loved them. The weather was pretty darn chilly. I think it was in the 40's and we had an outside ceremony. I felt bad for everyone like we should have changed it to indoor but then the restaurant would have had to have everyone waiting in their main room while they fixed everything back to the reception look. It worked out great.